The semi-annual conference of the Church of Jesus Christ of Latter-Day Saints will be held Saturday and Sunday in the Temple Square area in downtown Salt Lake City. The conference attracts people from around the world and the downtown area will be crowded. Most activities will be held in the Conference Center adjacent to Temple Square. People on Temple Square will be able to hear and watch some of the proceedings. Visitors are welcome to a participate in most events. Meetings will be held in the Conference Center, and free tickets are required to enter. Tickets go fast and are difficult to obtain at this date. Overflow crowds will watch from the Tabernacle on Temple Square. Audio from the conference can be heard all around the Temple Square grounds. Temple Square offers extensive gardens and several fountains. If the weather is nice, many people will listen while touring the gardens or sitting quietly one one of the benches. Sessions will begin at 10 am and 2 pm on Saturday and Sunday, and at 6 pm on Saturday. People attending the conference are encouraged to take TRAX into the downtown area to reduce traffic congestion. Restaurants in the downtown area will be busy after sessions. See the church website for more information about the conference. Scheduled flights are now being offered between Moab UT and Las Vegas McCarran International Airport, and also between Moab and Page AZ. "This connection to Page and Las Vegas is a great addition to our existing service. Itwill provide options for visitors and residents alike to access not only the Moab area but Las Vegas, Denver, and northern Arizona." said Mayor Dave Sakrison. "For many years the businesses in the Moab area have been hoping to develop an established flight to Las Vegas. This change in Great Lakes’ flight schedule will have a significant impact. The community is eager to develop a greater tourism base and this is the change we need to make that happen. We are happy to see the changes and are anxious to begin working with the airline to establish higher enplanement numbers at Canyonlands Field." said Marian DeLay, Executive Director of the Moab Area Travel Council. "This additional service is just what our tourism businesses have been pushing for inorder to make Moab accessible to the many inexpensive flight options in and out of Las Vegas. These flights will give us a real competitive edge as a tourist destination," said Bob Greenberg, Grand County Airport Board member and former County Councilman. "The new flight schedule and connections are just what the airport needs to boost enplanements. I am also excited for the local businesses to be able to tap into anew market and broaden the tourist base. It is my hope and desire to grow this routeso that it becomes economically sustainable. At a time when every enplanement is critical, this could not have come at a better time," said Kelly Braun, Canyonlands Field Airport Manager. To purchase tickets on Great Lakes Airlines, visitwww.flygreatlakes.com, call the Great Lakes’reservation center at 800-554-5111or visit your travel agent. All scheduled flights are operated under the Great Lakes Airlines marketing identity in conjunction with code-share agreements with United Airlines and Frontier Airlines at their Denver, Phoenix,and Billings hubs. Code-share agreement with only United at their Ontario hub; and only Frontier at their Albuquerque, Las Vegas and Milwaukee hubs. Utah's backcountry offers opportunity for extraordinary adventure, attracting serious outdoorsmen from around the world. Adventures can range from mild hikes to strenuous and dangerous climbing, rappelling and off-trail bushwhacking. Many people dream about serious adventure, but don't feel they have the knowledge and experience needed to trek into the backcountry. Others charge ahead, and occasionally get into trouble because their thirst for adventure outpaces their skill sets and physical capabilities. Two good options can help people enjoy adventure more safely. One is to participate in group outings and classes. Most of Utah's national parks offer ranger-led outings. Colleges, community education programs and other educational organizations often offer classes where you can learn outdoor adventure skills. Often the classes include field trips. The other option is to go with a professional guide. Professional guides can be found in all of Utah's popular destinations and they offer a wide range of adventures, from whitewater rafting to canyoneering and climbing. See our list of professional guides. National Park Traveler has this article giving good info about how and why to hire a guide for Utah adventures. Below are a couple excerpts. Guides can take you to the best places and show off the secret spots. In effect, a guide can put you on the “fast track to being a local,” says Amelia Gull of Zion Adventure Company, and help make your visit more meaningful. One good place to start is Utah Guides and Outfitters, which currently lists 50 recreational outfitters in the state. 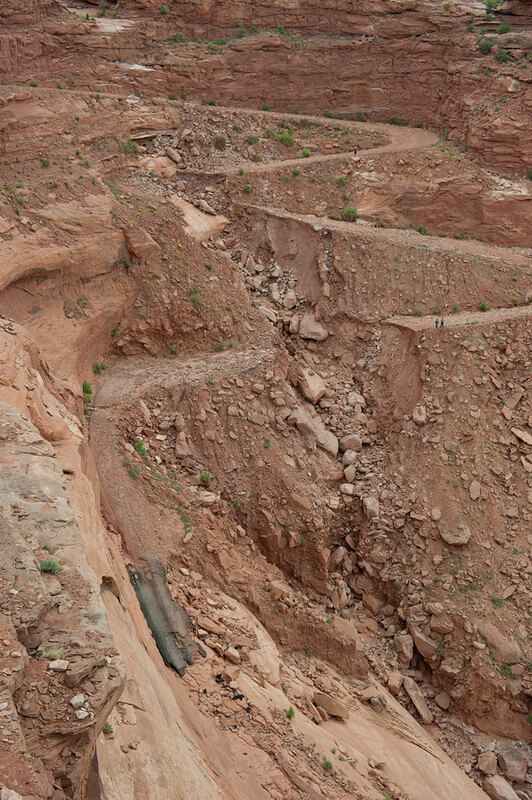 A section of the Mineral Bottom Road, adjacent to Canyonlands National Park, was destroyed last August when a massive flood cut through switchbacks. Repairs are now being completed and the road is expected to reopen Tuesday, March 29. The Mineral Bottom Road has traditionally been used as a leg of the White Rim Trail loop. Since the Mineral Bottom Road washed out in August, it has not been possible to do the complete loop. Now, with the road reopening, Canyonlands National Park is again accepting reservations for the loop. If you look closely at the photo you will see 2 people standing to the right of the washout. They give perspective to the photo. According to the Bureau of Land Management, the Mineral Bottom road will be open and passable on Tuesday, March 29, 2011. In anticipation of this, the Canyonlands reservation office is now accepting permit applications for White Rim trips that begin April 1, 2011 through the end of the year. Until the road is opened, trips around the entire White Rim Trail are still not possible. Road construction along the Mineral Bottom switchbacks continues, and the blasting area remains closed to all travel (both motorized and non-motorized). Visitors can still travel along most of the White Rim Road, though the last 14 miles (beyond Potato Bottom) remains closed to motor vehicles. At Zion National Park, private vehicles are not allowed to drive into Zion Canyon during the tourism season. A free shuttle service is provided to carry visitors to popular spots in the canyon. The shuttle will resume operation on April 1. The shuttle is a great service. By riding it, people can quickly and easily get to trailheads and attractions in Zion Canyon. The Zion National Park Transportation System will begin shuttle operations on Friday, April 1, 2011 and provide daily service through October 30, 2011.This marks the twelfth year of operation for the popular shuttle system in Zion National Park and Springdale, Utah. The shuttle system is supported by park entrance fees and all shuttles are fare-free. Parks Transportation, Inc., a subsidiary of McDonald Transit of Fort Worth, Texas, operates the shuttle service. The shuttle system services nine shuttle stops in the town of Springdale and nine shuttle stops inside the park. The Zion Canyon Shuttle provides improved access to points of interest, trailheads, the Zion Canyon Scenic Drive, and facilities such as the Zion Lodge and Zion Human History Museum. While the shuttle system is in operation, the Zion Canyon Scenic Drive is closed to private vehicles. Confirmed guests at the Zion Lodge may drive to the lodge, but cannot travel past the lodge or make any stops along the way. All other roads in the park are open to private vehicles, including the Zion-Mount Carmel Highway which connects to State Route 9 at the south and east entrances of the park. Daily operation begins with an express shuttle departing from the Majestic View Shuttle Stop in Springdale at 6:35 a.m. and departing from the Zion Canyon Visitor Center Shuttle Stop in the park at 6:45 a.m. Regular shuttle service starts at 7:00 a.m. Initially, the last shuttle traveling up canyon from the visitor center will depart at 9:30 p.m. and the last shuttle traveling into town will depart from the Zion Canyon Theater Shuttle Stop at 10:00 p.m. Hours of operation will expand during the summer. Shuttles depart from designated stops every seven to ten minutes during the middle of the day and approximately every 10-15 minutes in the morning and evening. Visitors are encouraged to park in designated parking areas in Springdale, ride the Springdale Shuttle to the park's pedestrian entrance, and board the Zion Canyon Shuttle at the Zion Canyon Visitor Center. The Zion Canyon Visitor Center, open from 8:00 a.m. to 5:00 p.m. daily, offers park information, backcountry permits, reservations for the Zion Lodge, and a bookstore which sells maps, books, and other items that may enhance a visit to the park. For additional information, visit the park's website at www.nps.gov/zion or call 435-772-3256. Our title above is taken from this Salt Lake Tribune article about snow levels at Utah resorts. We are in a wet cycle and snowpack is running above normal. More storms are expected and so resorts are pushing back their closing dates. Here are excerpts from the news article. A series of storms hitting the state during the next three days could add another couple of feet at favorable locations like Alta Ski Area in Little Cottonwood Canyon. Alta boasts a state-leading 527 inches so far this season and will easily pass its annual average of 540. The deep snow has already persuaded Canyons resort to extend its planned closing date by a week to April 17. Alta, Brighton and Brian Head resorts all plan to be open through Easter Sunday. Alta will close during the week after Easter and reopen for the April 29-May 1 weekend. Snowbird, just down from Alta, is scheduled to remain open through Memorial Day. Snowbird is famous for keeping lifts running on weekends as long as there is snow, and so it may well extend skiing beyond Memorial Day weekend. Some years there has been skiing on the Fourth of July. The Visitor Center at Cleveland-Lloyd Dinosaur Quarry will be open for its spring season beginning this Friday. The Visitor Center is closed during the winter and open for limited hours during the spring. Hours are expanded during the summer. Cleveland-Lloyd is a working quarry. At times, visitors can watch as researchers work to identify and excavate dinosaur fossils. The facility also participates in some activities where volunteers can get involved in real digs. The Cleveland-Lloyd Dinosaur Quarry, managed by the Bureau of Land Management, opens March 25. The quarry site will be open Friday-Sunday through the last weekend of May (10 a.m. to 5 p.m. Friday and Saturday, noon to 5 p.m.). The schedule for the rest of summer is yet to be determined. The entrance fee is $5 for visitors 16 and older. The Cleveland-Lloyd Dinosaur Quarry is 30 miles south of Price. Contact the BLM Price Field Office, at 435-636-3600 for more information. Utah’s first liquefied natural gas station opened today, adjacent to the junction of I-80 I-15, in Salt Lake City. It is expected to become an important hub for drivers using the clean-burning fuel. Forbes.com has this article about the new station. Below are excerpts. Along with five hoses for LNG service, the station will offer 12 hoses for compressed natural gas that is more commonly used by passenger cars and light-duty trucks, said Merritt Norton, chief executive officer for CH4 Energy, the company that will operate the station. Utah already has good infrastructure for CNG vehicles, with more than two dozen stations open, Norton said. Many of those are along I-15. Because it is domestic, natural gas provides energy independence and boosts the economy, said Utah Gov. Gary Herbert. But he cautioned that natural gas supplies depend on access to gas wells. The snow is still coming down and spring ski conditions are good at our mountain resorts. But the season is winding down - many resorts will close in mid- or late-April. Canyons Resort likes to close out the season in style and is once again offering its popular Spring Gruv event. Skiutah.com provides details in this news release. In 2011, Canyons Resort hosts the fourth annual Spring Grüv. 10 days of events, concerts, and contests! To kick everything off on Saturday, March 26 is the ever hilarious Pond Skimming. Contestants dress up in costumes and attempt to ski or snowboard across a 100 foot pond, there are prizes for people who make it across the pond, best costume, and best trick. A free concert by Los Lobos will follow in the Resort Village. Registration can be found online at http://www.thecanyons.com/events.html?textid=169 and is open to the first 100 applicants. The next day, on Sunday, March 27, Canyons will host John Popper and The Duskray Troubadours, free concert in the Resort Village. Come check out Blue’s Traveler front man and the musician known as "the greatest harmonica player in the world", John Popper in his solo endeavor. Also on the schedule is the Red Bull Schlittentag. Join us at Canyons on Saturday April 2nd for another crazy fun race. Schlittentag is the German word for “sledding day.” Put simply, it translates as “daredevils willing to propel themselves down a snow-covered hill and over a jump on a sled they built themselves.” This will be the most winter fun you’ve had sitting down. Three person teams will stretch their imagination to build the wildest, fastest sled this side of the Alps. One will be the pilot and the two others will help give their sled the push it needs to win the race and the fame and fortune that follows. Registration can be found online at http://www.facebook.com/event.php?eid=127194774018988 and by emailing Jack Stauss at jackstauss@redbullu.com. A free concert of the Tosh Meets Marley Celebration Tour will be held in the resort center following the event. On Sunday, April 3rd, the final day of Spring Grüv, Grete Eliassen, who in 2010 set a women’s world record by launching 31' in the air off a hip feature at Canyons Resort, will be showing her new film, "Say My Name." The movie will be shown for FREE at 6:00pm in the Grand Summit hotel.The ski movie, "Say My Name," was a two-year venture Eliassen embarked upon with longtime ski/snowboard photographer Stan Evans and is highlighted by her record-breaking hip jump at Canyons Resort in April 2010. Spring Grüv will run from March 25 to April 3, 2011. Check out www.springgruv.com for more details! Celebrate. Compete. Watch. Ski. Ride. Grüv. Huffingtonpost.com has this new article about spring skiing, recommending the Park City area. In particular, the article focuses on Canyons Resort. Whether it's about the slopes, the food, the lodging, or the tweets, Canyons is doing a lot of things differently, but it's also doing everything right. ...During my Sundance trip, I found myself duly impressed by this new and improved playground. With an emphasis on the ski experience as a whole and an innovative social media campaign to keep Canyons relevant, now's definitely the time to check it out -- especially since the season was just extended through April 17. In addition to the funky orange lift polka-dotting the mountain, Canyons has added a new direct-connect gondola from the village, over 300 acres of expanded terrain (aided by another quad) that ups the number of trails to 176, and vastly improved snowmaking capabilities with a 20 million gallon reservoir. Already bearing the title of Utah's largest resort, Canyons also ranks as Park City's most challenging mountain. So while heli-skiing has always garnered its share of fans, Canyons' new mile-long tricked-out Terrain Park off Snowdancer (Saddleback Express lift) ups the ante for boarders, and Steep Skiing Camp taught by World Skiing Champion Brent Moles takes skiers on a journey way too adventurous for my intermediate-ski blood. There is a sweet little ranch for sale adjacent to Zion Park. Called the Trees Ranch, it is 2,066 acres, on the East Fork of the Virgin River, just below Prunaweap Canyon on the edge of the park. It comes complete with its own 50 acre reservoir. I would buy it today if I had $30 million. The land has Zion-like qualities, which raises the question: Should land like this be held by private individuals? Bordered on two sides by the national park, on another by the Canaan Mountain Wilderness, and on the fourth by U.S. Bureau of Land Management acreage, the Trees Ranch dates to 1982, when the late Jim Trees, who founded a New York City investment firm, was on the faculty of the Harvard Business School, and helped launch the Grand Canyon Trust, saw a landscape that rivaled the beauty of nearby Zion. "Jim had the vision to assemble Trees Ranch starting in 1982 with the dream of making it a national park of this own, while bringing 200 acres of land into organic production. He dedicated himself to a conservation ethic for the rest of his life and was an excellent steward of this land as a result," says Bill Budinger, a friend of Mr. Trees and a fellow Grand Canyon Trust board member. The sellers, heirs to Mr. Trees, hope to see the 2,066-acre ranch sold to conservation-minded individuals or organizations that will run the operation as did Mr. Trees. Do you know anyone with $30 million? We could subdivide the property and sell condos. 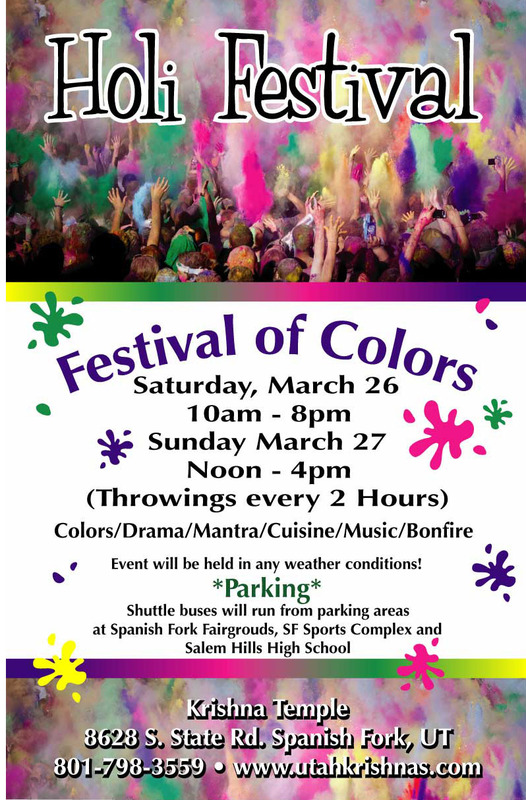 The annual Festival of Colors will be held March 26-27 at Sri Sri Radha Krishna Temple, in Spanish Fork. The festival has become very popular in recent years, attracting revelers from throughout Utah and neighboring states. To accommodate the crowds, additional parking is being made available at the Spanish Fork Fairgrounds, Spanish Fork Sports Complex and Salem Hills High School. Shuttles will run between the temple and the parking areas. US Hwy 189 between Spanish Fork and Salem will be congested during the festival. The traditional throwing of colors will be held several times during the festival, which also offers drama, food, music, a bonfire and other activities. Holi is the Festival of Colors, a traditional Indian holiday celebrated in our own innovative fashion. By far our biggest festival of the year, during Holi 2010 thousands of revelers flooded the temple and grounds for a day of brightly colored powder, mantra, music and a bit of "holi" mayhem. This year, realizing that Holi has developed a national following especially among college festival-goers, we are preparing more parking and more colors (by far) than ever before. The music, the dance, the worship, the facilities -- everything is being upgraded for Holi 2011. I was asked to help lead a student photo safari through Arches National Park, and was glad for the chance to participate. Arches is one of the most photogenic of Utah's national parks. We had a wonderful time and I was able to get a few nice images myself, including the three that illustrate this blog entry. The weather was perfect for our weekend trip. Temperatures were pleasantly warm - we hiked in shirt sleeves, not even needing a jacket. Evening temperatures were cool but not cold. We camped in Moonflower Canyon, along the Colorado River west of Moab, and we were very comfortable. Right now is an ideal time to visit Arches, and the surrounding area. So, where do you focus your cameras when on a photo safari in Arches? We chose Delicate Arch for sunset photos. We arrived about an hour before sunset and snapped photos as the sun settled low on the horizon. Sunset is the best time for photos in Arches because the quality of light gives photos a rich, warm tone. We all chose strategic positions to be ready for the magic moment when the sun touches the horizon and the sky explodes with color. We continued shooting as twilight set in, and then hiked back as the sky darkened. We carried flashlights but did not need them, since we reached the parking lot before it was complete dark. For sunrise photos we chose Double Arch. You can drive right up close to that arch, in the Windows Section. That was nice because it allowed us to sleep a little later, not having to face a long high in the early twilight. First could hours of daylight also offer great light conditions, with rich colors. We also hiked into the Devils Garden, looking for photo opportunities, and we weren't disappointed. There are photogenic subjects in every direction. I was pleased to see that the park has improved the trail in the area of Landscape Arch. In years past, it was tough to get a dramatic photo of landscape because park visitors are not allowed to hike up under the arch. Now, they have extended the fenced trail to include a grant photo vantage point, angled to allow a wide section of blue sky to show under the arch. That makes photos much more impressive. As always, the time flew by and we wished we could have spent an entire week in the park. But we enjoyed the time we had and left hungry to return. Come to this state park in Castle Country to see amazing rock formations that look like weird birds, magic mushrooms, and goofy gremlins. A ll of Utah’s stark canyon country inspires awe, but no place fires up the imagination quite like Goblin Valley State Park, a rockbound fantasyland 90 minutes northwest of Moab. Once called Mushroom Valley for its toadstool-shaped pillars of sandstone, the site opened in 1964 as a 3,654-acre geological reserve filled with odd forms that range from fungal to ghostlike. A short path descends from the parking lot to the valley, where visitors are free to roam among formations resembling big gremlins, chess pawns, or—to the hungry—cocoa-dusted marshmallows. “People say they see birds, ducks, dogs, noses,” says ranger’s aide Jordan Perez of the structures carved by ages of wind, water, and ice. I fished Utah Lake today, trying for walleye, and had a great time. Action was slow - I did not catch any walleye - but it was fun putting the boat out on the water. I did catch the white bass shown in the photo. Fishing success should pick up as the water warms a bit. Utah Lake is home to several species of sport fish, but it is walleye at draw attention at this time of year. They usually provide good fishing beginning about the middle of March. The lake also has many white bass and channel catfish, and they can also provide good action. Otter Creek and Piute reservoirs in southern Utah are now ice-free and they are providing fair to good trout fishing. Deer Creek, Jordanelle, Rockport and other mid-elevation waters in northern Utah will probably shed ice during the next few weeks. Fishermen anticipate the ice-off period because it often brings good action. Since waters are still cold, trout can range freely. They can often be found along the edge of the ice as it pulls back, and up tight against the bank. Shore fishing is good during this period because the fish are easily accessible. However, shore fishermen sometimes cast right over the fish because they think they need to reach deeper water. The best fishing is usually shallow. Lake Powell has provided surprisingly good fishing this winter. Striped bass, smallmouth bass and largemouth bass almost provide great fishing at the big lake beginning in early April. The Spiral Jetty Earth art on the edge of the Great Salt Lake was built 40 years ago. Over time it has come to be one of the most famous works in its class, recognized world-wide. Comprising works by twenty-two international artists and artist collaboratives, The Smithson Effect is organized around core ideas in Smithson's practice that have critically shaped contemporary art, including entropy, land use, anti-monuments, natural history, and the materiality of language. The Salt Lake Tribune has this article about the building of the Jetty. Below are excerpts. "I didn’t understand what he was trying to do," (contractor Bob) Phillips recalls of the meeting 40 years ago. "I kept trying to convince him that he had to follow contracting rules with engineers and surveying and all that kind of stuff." Smithson, in whose monumental spiral critics would see space galaxies, snail shells and the microscopic structure of salt crystals, already had been rejected by other contractors. "He just kept saying he knew what he was doing," Phillips says. Smithson finally wore Phillips down, and the contractor went on to help build one of the world’s iconic art works. In the process, Phillips struggled to understand what Smithson was trying to express through the Spiral Jetty. Smithson was influenced by Utah’s landscape, ecosystem, history and culture in creating the Spiral Jetty, says Hikmet Loe, a curator and art historian who teaches at Westminister College. In turn, the Jetty is changing the way Utah and the rest of the world think about their environment. Jackson Holtz writers for the Herald, in Everett, Washington. He recently penned this article touting Park City ski resorts over nearby Whistler, which is much closer. He offers interesting arguments. Below are excerpts. Flights to Salt Lake are abundant, and many offer bargains. Add in deals on lift tickets and lodging, and a weekend getaway to the gorgeous Wasatch Mountains can be simpler and cheaper than a trip to Whistler. Leave behind the infamous Pacific Northwest concrete snow found at its ski areas. Instead, find short lift lines, terrific weather and long runs that stretch thousands of feet. I chose to rent skis to save the hassle of schlepping my skis on the airplane and paying oversized baggage fees, $55 each way on Delta. A basic rental package for skis and poles from the resort was $45 for the entire long weekend, saving me $65. A friend of mine found a bargain fare to Salt Lake City from Seattle for $90 each way on Southwest Airlines. She saved even more because Southwest doesn't charge baggage fees, so she did bring her skis. Three huge resorts circle the town. Deer Valley is reserved for skiers only and is known worldwide for luxurious amenities, including a ski valet. The Canyons' claim to fame is a chair lift that features heated seats. Park City Mountain has lots to offer families including daylong snow schools; the Alpine Coaster, a roller coaster that provides an on-the-mountain experience for nonskiers; and www.snomamas.com, a website that provides family travel tips from real moms. Livescience.com has two interesting articles ranking the happiness factor of American states. This one ranks Utah as the happiest in the US. Using different criteria, this study ranked Utah at #5. It is interesting to compare the studies. The first study had this conclusion: "On average, well-being was highest in the Mountain states and West Coast states, followed by the Eastern Seaboard and then the Midwest and Southern states." That was largely based on the idea that people are happier where their needs are met, where states offer jobs and infrastructure, diversity and opportunity for creativity. The second study also considered a self-evaluation factor, with this conclusion: "In addition to rating the smile factor of U.S. states, the research also proved for the first time that a person's self-reported happiness matches up with objective measures of well-being. Essentially, if an individual says they're happy, they are." "Their results come from a comparison of two data sets of happiness levels in each state, one that relied on participants' self-reported well-being and the other an objective measure that took into account a state's weather, home prices and other factors that are known reasons to frown (or smile). The self-reported information came from 1.3 million U.S. citizens who took part in a survey between 2005 and 2008." Any way you look at it, Utah ranks well because of our strong economy, great natural environment and friendly people. All 12 backcountry campsites in The Narrows in Zion Park are closed until further notice because they were almost certainly damaged by severe flooding in late December. They will remain closed until park rangers have a chance to evaluate and stabilize them. Below we provide the text of the Zion Park news release about the closure. Also in Zion Park, the Zion Human History Museum and the South Campground will reopen on Saturday, March 5. They have been closed for the winter. Canyon Trail Rides will offer one and three-hour guided horse trips on the Sand Bench Trail starting Saturday, March 12. Details. All of the campsites located in the Narrows of Zion National Park are closed until further notice. Park rangers believe that many of the backcountry sites were affected by this winter's floods. These campsites will remain closed until park rangers can safely enter the area, assess the damage and perform any rehabilitation work that the sites may need. In late December 2010, heavy rains caused extensive flooding on the North Fork of the Virgin River, including the Narrows. The flow rate for the river was measured at 6,000 cubic feet per second, the highest recorded rate since the campsites were created. Twelve designated backcountry campsites were created in the Narrows in the early 1990s in an effort to concentrate visitor impacts at specific locations and create a more enjoyable trip for visitors. The Zion Narrows is closed to hikers each spring due to high water from snow melt. In an average year, the period of high water ends around the beginning of June. The closed campsites will be evaluated as soon as water levels allow rangers to visit the area. Many of the campsites should be opened quickly, but some may have to be re-located and may remain closed for several months. The National Park Service reminds visitors that all overnight trips in the Narrows require a backcountry permit. In an average year, reservations for overnight trips are available two to three months ahead of time through the park website at www.nps.gov/zion/planyourvisit/backcountry-reservations-and-permits.htm. In 2011, reservations will not be available until an evaluation of the campsites is complete. The Narrows are a spectacular gorge carved in the upper reaches of Zion Canyon, 16 miles long, up to 2000 feet deep, and at times only 20-30 feet wide. Hiking this route can be an unforgettable wilderness experience, but it should not be underestimated. At least 60% of the hike is spent wading, walking, and sometimes swimming in the North Fork of the Virgin River. There is no maintained trail; the route is the river. The current is swift, the water is cold, and the rocks underfoot are slippery. Flash flooding and hypothermia are constant dangers. Good planning, proper equipment, and sound judgment are essential for a safe and successful trip. For more information on the Zion Narrows visit the park website at www.nps.gov/zion/planyourvisit/zion-narrows.htm or call 435-772-0170. With spring fast approaching, Utah ski resorts are evaluating conditions and scheduling closing dates. Several may extend their seasons if snow conditions permit. As of now, the Salt Lake Tribune has this report giving tentative closing dates. The city of Provo is just 40 miles south of Salt Lake International Airport, and so its airport has been slow getting scheduled flights from major airlines. But that will change in June, when Frontier begins daily flights between Provo and Denver. The announcement was made today by Provo's mayor and Frontier executives. The Salt Lake Tribune has this article about the announcement. Below are excerpts. The seven-days-a-week service starts June 20, Daniel Shurz, Frontier’s vice president of strategy and planning, said Wednesday. "Obviously, with the population in Utah Valley increasing, we see the demographics as very favorable. We want to take advantage of that," he added. Utah County is one of the fastest-growing in the U.S. With a population of more than 500,000, its population was up more than 40 percent from 2000. By contrast, the state’s population increased 25 percent in the same period, according to the U.S. Census Bureau. Frontier’s Shurz said the proximity of Utah County to Salt Lake City International, where Delta Air Lines maintains its western-most U.S. hub, isn’t the big drawback to operating a profitable Provo-to-DIA route that some might think. Frontier also won’t cut the number of daily flights between Salt Lake City International Airport and DIA. In fact, the carrier plans to start a sixth daily flight between the two airports on June 6, Shurz said. Utah County’s business community has asked for years why commercial airline service isn’t available in Provo. (Provo Municipal Airport manager Steve) Gleason said the city occasionally saw interest on the part of airlines, but nothing ever came of it until last year. Houseboats are nice, they are much like a condo that floats, providing all of the comforts of home while you enjoy the spectacular scenery at Lake Powell, which is one of the world's most popular houseboating destinations. Some people are reluctant to book one of the big boats because they don't think they have the skills needed to operate the craft safely. The information below was provided by Lake Powell Resorts and Marinas, a concessionaire at the lake with a large fleet of rental boats. Plus get a discount on your future houseboating trip! Have you always dreamt of taking a houseboat vacation but haven't because you don't know the first thing about captaining this large vessel? Well now we're making it easy to experience your vacation of a lifetime with our Introduction to Houseboating weekend program at Lake Powell.